This is most commonly used protection scheme for the alternator stator windings. The scheme is also called biased differential protection and percentage differential protection. In this method, the currents at the two ends of the protected section are sensed using current transformers. The wires connecting relay coils to the current transformer secondaries are called pilot wires. Under normal conditions, when there is no fault in the windings, the currents in the pilot wires fed from C.T. secondaries are equal. The differential current i1 - i2 through the operating coils of the relay is zero. Hence the relay is inoperative and system is said to be balanced. When fault occurs inside the protected section of the stator windings, the differential current i1 - i2 flows through the operating coils of the relay. Due to this current, the relay operates. This trips the generators circuit breaker to isolate the faulty section. The is also disconnected and is discharged through a suitable impedance. The Fig.1 shows a schematic arrangement of Merz-Price protection scheme for a star connected alternator. The differential relay gives protection against short circuit fault in the stator winding of a generator. The C.T.s are connected in star and are provided on both, the outgoing side and machine winding connections to earth side. The restraining coils are energized from the secondary connection of C.T.s in each phase, through pilot wires. The operating coils are energized by the tappings from restraining coils and the C.T. neutral earthing connection. The similar arrangement is used for the delta connected alternator stator winding. as shown in the Fig. 2. The C.T.s on the delta connected machine winding side are connected in delta while the C.T.s at outgoing ends are connected in star. The restraining coils are placed in each phase, energized by the secondary connections of C.T.s while the operating coils are energized from the restraining coil tappings and the C.T. neutral earthing. If there is a fault due to a short circuit in the protected zone of the windings, it produces a difference between the currents in the primary windings of C.T.s on both sides of the generator winding of the same phase. This results in a difference between the secondary currents pf the two currents transformers. 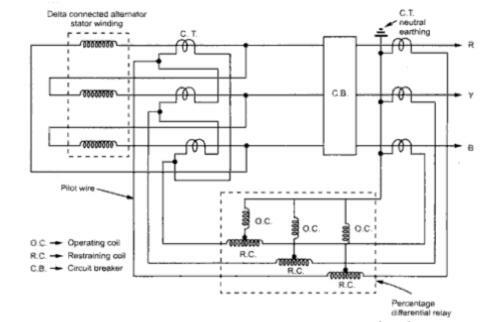 Thus, under fault conditions, a differential current flows through the operating coils which is responsible to trip the relay and open the circuit breaker. The differential relay operation depends on the relation between the current in the operating coil and that in the restraining coil. 5. Turn on of CO2 gas if provided for safety of generator under faulty conditions. 6. Operation of alarm and / or annunciator to indicate the occurrence of the fault and the operation of the relay the field must be opened immediately otherwise it starts feeding the fault. When differential relaying is used for the protection, C.T.s at both the ends of generator must be of equal accuracy otherwise if the error is excessive, wrong operation of the relay may result. The cause of unequal currents on both the sides of C.T.s without any fault are ratio errors, unequal lengths of the leads, unequal secondary burdens etc. This scheme provides very fast protection to the stator winding against phase to phase faults and phase to ground faults. If the neutral is not grounded or grounded through resistance then additional sensitive earth fault relay should be provided. 1. Very high speed operation with operating time of about 15 msec. 2. It allows low fault setting which ensures maximum protection of machine windings. 3. It ensures complete stability under most severe through and external faults. 4. It does not require current transformers with air gaps or special balancing features.